Located in the colorful Mission District of San Francisco, Vida brings to life a long-vacant space as an upscale, mixed-use residential and retail, urban infill project. Designed by DLR Group|Kwan Henmi, the façade reflects the color and texture of the neighborhood's Latin-influenced murals, craft and culture, and is scaled with respect to the adjacent buildings' varied heights and setbacks. Finished by Linetec in a Snow White color, Winco Windows' products provide a neutral contrast to the multicolored, modern exterior. 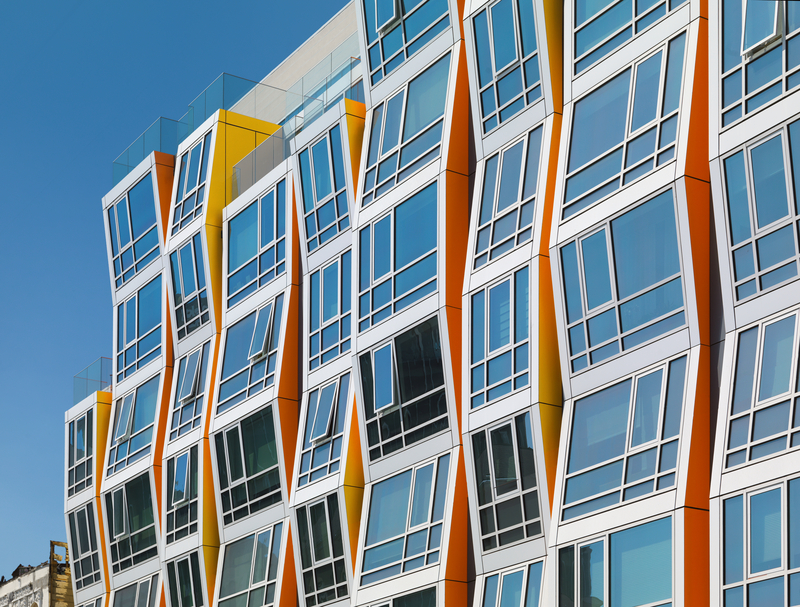 Along with defining Vida's rhythmic appearance, the window systems assist the building in surpassing California Green Building Standards (CALGreen) code's modern performance. Owned by Oyster Development, the eight-story, 150,000-square-foot building houses 114 condominiums with ground-level retail, tenant lounge areas, a secluded courtyard and a rooftop deck. The project's $70 million scope also involved rehabilitating the New Mission Theatre and converting it from a one-screen venue to a five-screen, 900-seat theater with a bar. Dean Givas, president of Oyster Development, explained, "The weaving, undulating facade is meant to evoke the culture of textiles and craft and also create a sense of movement. The marquee of the theater next to the project is very strong. We favor contemporary design and believe that the best way to highlight historic architecture is to complement it with a modern facade." Kwan Henmi continues the description, adding, "The project showcases quality and urban living. Meticulous details weave the project tightly into the existing vibrant urban fabric. The design utilizes contemporary schemes and materials to bring individuality to the building and dwelling units. 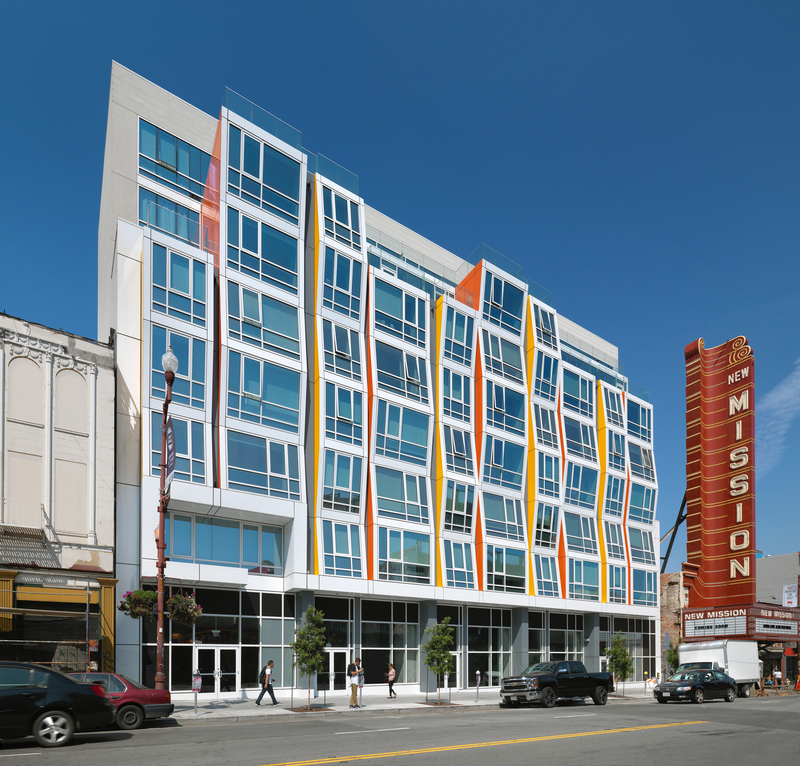 The vivacious façade reflects the dynamic culture of the Mission and of the young residents that will live in this new community." 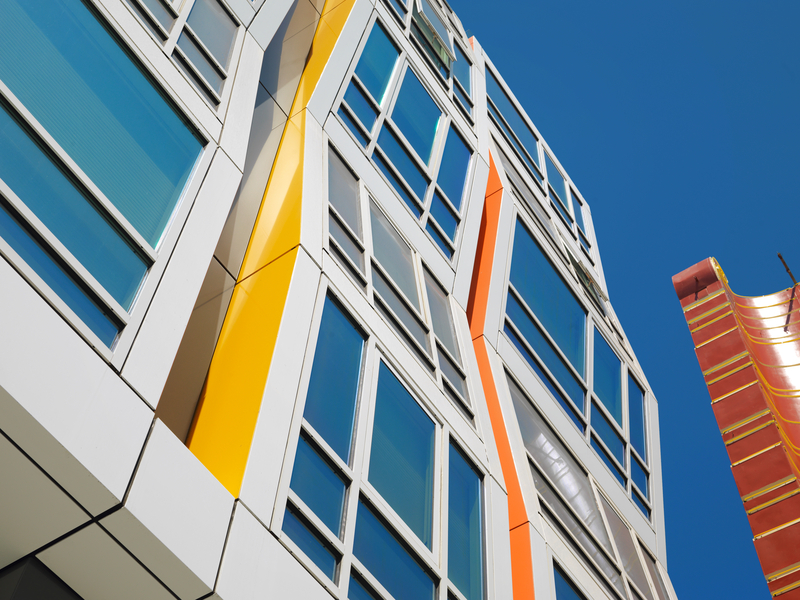 Achieving the modern look and performance, Vida's multifamily project goes beyond CALGreen's mandatory measures to become GreenPoint Rated. This rating certification is earned through Build It Green, a professional nonprofit organization that promotes healthy, energy- and resource-efficient buildings in California. Linetec supports Winco's products and their contribution to the project's green building attributes by applying both the durable Fluropon® 70 percent PVDF resin-based architectural coatings and the thermal strut for improved energy performance. Winco Windows' 1450 Series 4-inch unitized window wall accommodate Vida's large window openings with deep wall cavities. In addition, its 3325 Series 3.25-inch zero sightline vents provide natural ventilation and clean sightlines. Because these systems are manufactured with aluminum, Linetec prepares the extrusions and inserts a polyamide insulating strip. This thermal barrier system improves thermal performance, while maintaining the structural and long-term durability of the fenestration unit. As an environmentally responsible finisher, Linetec applies these high-performance painted coatings, and safely captures and destroys the VOCs present in liquid solvent-based paints before the finished products' arrival on the building site. Under Linetec's stringent factory-controlled processes, the finish meets the American Architectural Manufacturers Association's (AAMA) 2605 specification. The resulting long-lasting finish also helps reduce the building owner and residents' maintenance costs. Anticipating the residents' daily use, Winco's in-house team engineered the fully operable window vent system to minimize incoming rainwater if a window accidentally was left open. To successfully weep the vent cavity, Winco created a sloped, operable unit capable of draining water away from the building. "This project has a challenging design where the windows are sloped 7 degrees inwards and 7 degrees outwards in alternating columns," noted Bagatelos Architectural Glass Systems. Winco worked with Bagatelos to design a receptor system around the windows that helps withstand water infiltration and meets California's stringent seismic standards. Every single vent system was rigorously tested for infiltration before it left Winco's plant in St. Louis. In the nearly three years since Vida opened in December 2015, the window system has proven its performance and upheld its appearance. Named "San Francisco Market-Rate Residential Deal of the Year for 2014" by the San Francisco Business Times, Vida was sold-out by August 2015, four months prior to its completion.